We managed our usual set of benchmarks on the HTC DROID DNA and its Snapdragon S4 Pro chipset. We were curious to see how the four Krait cores and the Adreno 320 GPU handle the FullHD screen resolution. We started with the BenchmarkPi test, which reflects per-core CPU performance. As expected the Krait architecture helped the DROID DNA beat its quad-core rivals. More impressively, though, it managed to beat the LG Optimus G despite packing identical CPU cores as the LG flagship. Linpack is another CPU-testing benchmark, but it supports multi-threading and thus brings a better idea of the quad-core architecture overall processing power. 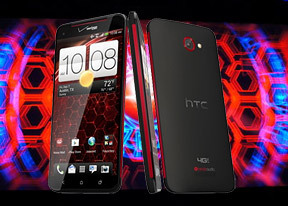 Here the HTC DROID DNA lost to the Optimus G by a very small margin, but blew the rest of the competitors out of the water. The Quadrant benchmark tries to evaluate the overall processing power of the chipset - CPU, GPU and memory performance. The HTC DROID DNA managed to top the competition here, which is a really impressive achievement given that its screen resolution poses a bigger challenge to the graphical power. The HTC DROID DNA didn’t do as well in AnTuTu, which is our other all-round benchmark. The smartphone did beat the LG Optimus G, but came behind the rest of the quad-core top dogs . The 3D graphics department is handled by the Adreno 320 GPU. The first test we ran was NenaMark 2, but just like its competitors the HTC DROID DNA managed to hit the 60fps limit of the screen, rendering the results moot. GLBenchmark let us get a better idea of the graphics power of the DROID DNA – the smartphone got the highest score of any smartphone we have tested so far. Given that its screen resolution is much higher than its competitors, though it’s can’t compete as successfully in on-screen tests. The HTC DROID DNA is a stunning performer and while it doesn't have the graphics power advantage to fully compensate for it vastly higher screen resolution that shouldn't be an issue in most of the real-life scenarios. We'll take a closer look at the HTC DROID DNA camera capabilities after the break.